We have all done it; wandering around the mall trying to get a clear cell phone signal. If you have not done this, then you have not traveled outside your coverage area too much. The only thing worse than being out of town trying to get a signal inside a building you are not familiar with is have to go outside your own home to get a clear connection. This problem becomes less prevalent as time goes on, especially for carriers like AT&T and Verizon who spend billions expanding their infrastructure. According to WhistleOut, of the big four providers (Verizon, AT&T, T-Mobile, and Sprint), Sprint wins the “Least Reliable Carrier” award. It sports an overall coverage reliability of 93.42 percent compared to Verizon’s number one ranking of 97.7 percent, according to independent testing. 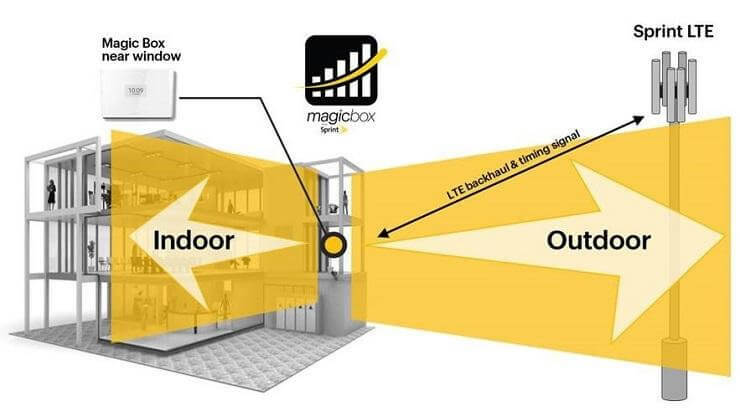 Sprint is attempting to mitigate this deficiency by introducing the “Magic Box.” The Magic Box is a cell phone signal booster that can increase cell strength up to 200 percent. The device is designed to be placed in a window and can extend a cell phone signal for as much as an additional 30,000 square feet indoors. As a byproduct, it can also boost the range outside up to 100 meters. So potentially, surrounding areas and buildings can benefit from the installation of one of the devices nearby. This enhancement will not solely be because of the Magic Box. Son claims that the company is working on “other network improvements” to help increase reliability. Arguably the best part is that Sprint will offer the device for free to qualifying customers. It is first giving the device to business clients, but in time the company will expand the offer to individuals who would like it in their home. Sprint was not forthcoming with what “qualifying” means, but it has a web page set up to check to see if you are qualified. "This enhancement will not solely be because of the Magic Box. Son claims that the company is working on “other network improvements” to help increase reliability." The best improvement they could make is actually putting up some towers outside the top 200 markets. Sprint is non-existent across most of the territorial US. Tanstar and Greg S like this. Very true. I've been traveling with friends before who have Sprint and it's almost comical to watch them try to make a phone call as they walk to just the right spot. Sprint isn't all bad though, but that's not saying much about the wireless providers as a whole. This could be a gamechanger for the telecoms industry tbh, it's effectively a wireless pico-cell relay. This could be a cheap way of expanding cell coverage across rural lands. Speaking for the UK where coverage is in the realm of 98%, the main bits that have slow coverage or no coverage are the Peak District and the South West like Cornwall. I do an annual hike of the three peaks and regularly have no coverage, for a hiker in an emergency this could potentially save your life. I hope the UK can employ this sort of technology. 100 meters or 300 feet will not you do any good in rural places. I agree, but it's a step in the right direction. It could mean wider range cells in the future, it could possibly allow a mesh of these to cover a wide area, they could have these to hire out for events like festivals etc. Also it would increase niche coverage nonetheless, like small dips and hills that block coverage for a small area. No, they have small cell and mobile temp deployment for that purpose. I'm not so sure about outside the top markets, but I do know it can be difficult to seek civil approval to build new towers. My father was at the court house where I live one day when sprint was seeking approval for a tower and the county would not allow it for petty reasons. My speculation is that, atleast in some instances, Verizon and the others may have influence with politicians. But who knows. Yes but this looks like a much more portable, temporary and cheaper way of achieving this. Verizon has had similar technology for years. Sprint's Palm Pre exclusive longer than 6 months?